↑ Janick, Jules and Robert E. Paull (2008). The encyclopedia of fruit & nuts. CABI. ISBN 0-85199-638-8. p. 696. ↑ Stacewicz-Sapuntzakis, M; Bowen, PE; Hussain, EA; Damayanti-Wood, BI; Farnsworth, NR (2001). 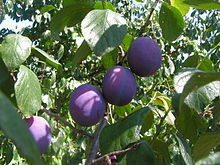 "Chemical composition and potential health effects of prunes: a functional food?". Critical reviews in food science and nutrition. 41 (4): 251–86. doi:10.1080/20014091091814. PMID 11401245. ↑ "USDA Database for the Oxygen Radical Absorbance Capacity (ORAC) of Selected Foods, Release 2" (PDF). United States Department of Agriculture. May 2010. สืบค้นเมื่อ 2013-04-13. ↑ 6.0 6.1 FAO/WHO Consultation on the Health Implications of Acrylamide in Food; Geneva, 25–27 June 2002, Summary Report. (PDF) . Retrieved on 2012-06-11. หน้านี้แก้ไขล่าสุดเมื่อวันที่ 16 ธันวาคม 2560 เวลา 15:22 น.